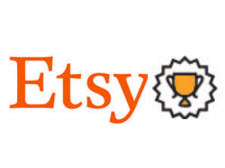 Etsy is testing a "Super Seller" badge on the listing pages of eligible sellers. As part of the test, which kicked off this week, Etsy is exposing the badge on seller listings to a percentage of buyers. The badge shows a cartoon trophy next to the words "Super seller." Etsy has been trying various techniques to boost conversion rates, including displaying badges to boost confidence and in some cases, to provide a sense of urgency. The Etsy Super Seller badge harks back to eBay PowerSeller badges, which eBay also used to give shoppers confidence in its site. Unlike Etsy's new designation, eBay also used its PowerSeller program to reward and punish sellers through monetary discounts and exposure in search results. In 2009, eBay replaced PowerSeller badges with Top Rated Seller badges, which were later replaced with Top Rated Plus badges. Over the years, eBay shoppers have had to get used to different badges while eBay raised the bar ever higher for sellers hoping to qualify. - And have 5 or more reviews, with the majority of reviews being 5 stars. Goal: Give shoppers more confidence in making a purchasing decision by showing them when a seller is running a successful shop, per the Super Seller criteria. 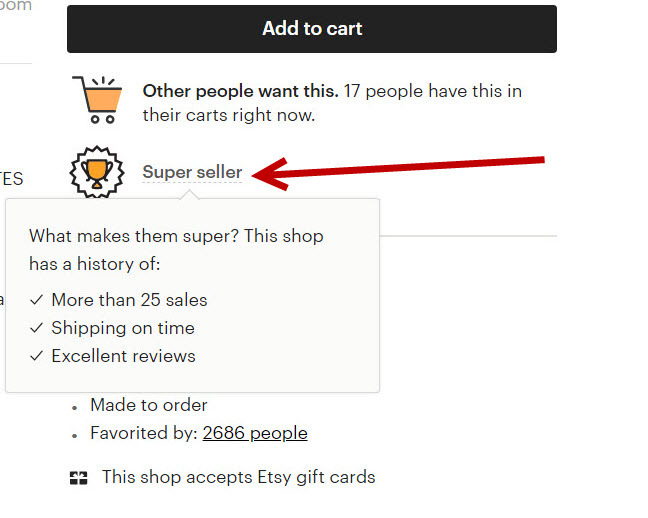 The screenshot below shows a Super Seller badge on an Etsy listing - if you hover over the badge on a live listing, you'll see the pop-up box shown that lists the criteria. Etsy sellers greeted the new "trophy," as they're calling it, as a positive development, though some said they thought Etsy set the bar too low at 25 sales. What do you think of the new badge, and what would you think if Etsy expanded it to include other benefits? Etsy is a DRAG to sell on. They're stickin' their nose in my business every 5 minutes. GET OUT OF MY SHOP AND STAY OUT ! I'M BUSY MAKING PEOPLE HAPPY. There is so many differences between Ebay and Etsy. This program is not like Ebay's powerseller program at all. First there is NO BADGE for being a PowerSeller, so buyers are not even aware of it. In fact, buyers don't even see a TRS badge on a seller's listing on Ebay UNLESS that listing qualifies for the seller discount. What kind of sense does that make? Why in the world would a buyer care if the sellers gets a discount on fees? The ONLY place you can tell if a seller is TRS is on their FB page. Not every change another site makes is about or because of Ebay. Sometimes it is just a change. Gimmicks. An ecommerce caste system serving no real purpose. My guess is that the draconian metrics can't be too far behind. Monkey see monkey do. Monkey needs to look at eBay's stock price. Gold Stars - Black Stars now this “Super Seller Badge”. I think this is all to get sellers minds off of LACK of sales. Stupid. Means zip. I have over 25 sales and over 5 5-star reviews and I couldn't care less about this. I suppose some sellers will find it a sort of validation, but it's just window dressing. Etsy's CEO does not have a mind of his own. He follows Ebay like a puppy dog hoping to catch a bone. The only things he changes are the things he learned at Ebay and doesn't realize that the last thing Etsy should be is another Ebay. Wait until he offers auctions. He already offers buy it now options. Etsy will eventually turn into ebay. Once you,re publically traded, the shareholders are ur bosses. That is ur only goal. Criteria is way too low! Not that it REALLY matters to me. Honestly. BUT, I just checked & I don't have no stinking badge. I have a 5-star rating, 2289 sales, 449 followers, got $400 worth of orders over this past weekend. Now I feel very left out. I may go stand in the corner & pout. Haven't seen any badges yet. I qualify for both shops, for length of time on the site (too stupid/lazy to leave). Sales are always dismal in October, by my stats. My own experience of Etsy is a LOT of seemingly "on/off" for sales. And it seems like both get sales around the same time, selling vastly different things. Those that sell obviously not handmade things get the sales, so if you're importing crap from China, Etsy will welcome you. Please do not ever call it vintage, tho, okay? As far as having auctions, I get requests every other week for discounts, or could they try one on for fit, or to match a suit, before payment. (There goes the turnip truck) I have been asked if it doesn't sell by __, they will buy it for (less than the cost of materials, usually). I send them to EBay and give a link to a kindly treatise on what handmade really means. Happily, my good customers are really wonderful and repeat buyers several times over. I still encourage folks to start an Etsy shop for their handmade goods, especially if they know how to price already. Etsy still has too many "garage sale" shops. Sellers don't care about that. They care about sales, net profits. They care about good products, low prices, good service. Sellers bash every site: Etsy, eBay, etc. Blame them for low or lack of sales. Sorry, folks... it IS Politics. It has sucked MORE money OUT of the ECONOMY. To shelter in Trust Funds. ALL that money is NOT out there to BUY your stuff. How many millionaires / billionaires are YOUR customers ? The average Joe does NOT have left over money to shop w/ YOU. Minimum Wage... if it was indexed for inflation like Social Security... would be over $20.00 now. That extra $2,000. in premium is $2,000. LESS you have to SPEND on eBay, Etsy, etc. So are yard sales, flea markets, thrift shops. For clothes, appliances, expired food, vitamins. We are becoming a TOW TIER SOCIETY. Have nots and have too much. BRING BACK Reagan's Tax Rates. FIX roads, bridges, tunnels, EISENHOWER style. LIFT Society. LIFT wages of MIDDLE CLASS. WHAT will these oligarchs DO when the next Recession hits ? BLAME immigrants who work FOR THEM for NOTHING ? Blame the old, sick, disabled... CUT Medicare Medicaid Social Security ? HOW LONG will you wear a RED HAT & cheer on a group who lies, steals & gets RICHER as we speak ? VOTE... VOTE for people like you. Stop blaming your Venue, your competitor. We ALL made money... we ALL got ahead. It IS the politicians that YOU vote for, or, don't bother to vote for... that are DESTROYING your CHANCE to get PAID for YOUR WORK. eBay has always dreamed of being Amazon, and as hard as they've tried, they've never come close, and never will. Now Etsy wants to be eBay. Shame, bc eBay stockholders have lost in their game, when eBay started copy-catting Azon. Etsy sick WAS doing super well!!!! until a few weeks ago when they showed their stockholders how badly they really want to be eBay -- Etsy stock has plummeted since all their recent changes. Etsy will mark my words one day. "CHILL already". Correction: "sick" should read "stock"
I know it is popular here to compare this new badge to Ebay, but the ONLY thing they have in common is the receipt of a badge. Nothing more. At least when Ebay started theirs for PowerSellers there were some benefits with it, even though now no one see the PS badge anymore. And with TRS there were and are benefits. So there is VERY LITTLE this move by ETSY has in common with an Ebay policy / badge past or present. These badges are baloney....silly stuff. I need traffic and I need sales. I would welcome an auction type system like ebay...at least I make sales there...I don't make sales on Etsy!